was bars that did not have a coat checking service available. After having his coat stolen at a bar without a coat check, Derek decided to address this specific pet peeve. Derek’s business started with simply meeting with the owner of a local bar. 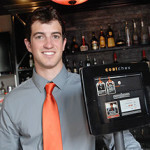 He learned that the bar was resistant to having a coat check because it was inconvenient, patrons often lost their tickets, and there was generally no space to house a coat check. As a solution, Derek offered to set up his own and take it down when it wasn’t needed. Not only did the owner agree, but he also immediately started working in three different bars that would otherwise be without coat checks. Derek put together a team and built storable coat check closets that could be taken down when not in use. When the company, called Hoosier Coat Check at the time, made $50,000 in the first few months, he knew he was on to something. However, through running this coat check company, Derek encountered several of the problems that bar owners warned about. Patrons often lost their tickets and failed to collect their belongings, and it was also difficult to track the money the business made. Presented with this problem, Derek thought of a better way. In order to solve these problems, Derek had the idea to create an electronic method of checking coats. He describes it as a “POS [point of sale] for coat checking”. In order to develop the app, Derek recruited people to build an application that would allow the company to check in coats with no need for a paper ticket. A picture is taken of the customer, who inputs their contact information into the app. This prevents customers from picking up the wrong jacket and also gives a way for the company to return belongings to those who never reclaimed their items. With this idea, CoatChex was born. Despite not walking away with a deal, Derek still appreciated the exposure that he got from being on the show. 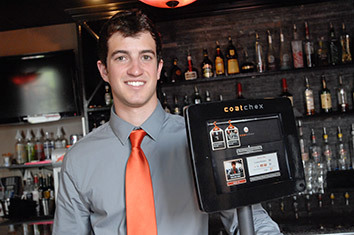 After the show aired to 8 million people, CoatChex received several potential business opportunities. Indeed, CoatChex is still expanding at an impressive rate and has since relocated its headquarters to New York. The idea that started in bars and nightclubs expanded to large events and even airports. CoatChex served such events such as the 2012 Maxim and ESPN Superbowl parties as well as the 2013 Fashion Week in New York. CoatChex also has two counters set up in JFK airport that allow fliers to store heavy jackets when they travel to warmer climates. The most innovative aspect of the company is the ability to adapt the technology to fit several different circumstances. When asked what is next for CoatChex, Derek excitedly started explaining the rebranding of Chexology, which is being launched this month. Chexology is the technology behind the app that gives the opportunity to create different tools for different situations. “Chexology is where I get to be exploratory”, he said about the technology. “If people trust the service you can provide it in a lot more places”. These other circumstances include not only big events, but also for dry cleaning, valet, and rental services. Although CoatChex has been very successful since its conception, Derek explains that there were several challenges when starting the business. A big hurdle for him was “Seeing that the real opportunity wasn’t in the pop up coat checks, but in the software.” Without a very technical background, Derek needed to find the right people that could implement his ideas in the app creation. Through quick learning and bringing on the right people to his team, Derek was able to overcome these difficulties and keep growing his company. For other aspiring entrepreneurs, Derek says that the hardest part is making something with your idea: “When you have an idea, at some point you have to stop thinking about it and take the first step to get that first customer. You don’t have to have a complete product.” Indeed, by addressing issues as they came up and progressing step by step, Derek created a company that revolutionizes the way we think about coat checks.